eCite - Compromise in the IWC: Is it possible or desirable? 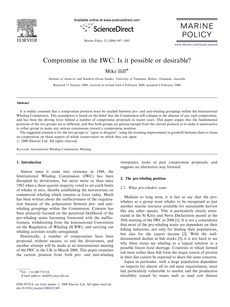 Compromise in the IWC: Is it possible or desirable? It is widely assumed that a compromise position must be reached between pro- and anti-whaling groupings within the International Whaling Commission. This assumption is based on the belief that the Commission will collapse in the absence of any such compromise, and has been the driving force behind a number of compromise proposals in recent years. This paper argues that the fundamental positions of the two groups are so different, and that both groups are getting enough from the current position as to make it unattractive to either group to make any serious concessions toward a compromise position. The suggested solution is for the two groups to "agree to disagree"; using the resulting improvement in goodwill between them to focus on cooperation on those aspects of whale conservation on which they can agree.